Bel Mar Coin Club has seen an increase in Members and some Visitors to almost every meeting lately. Our next Club Meeting is Monday January 19th, so click on the Auction Sheets Tab or the About Us Tab for more information. 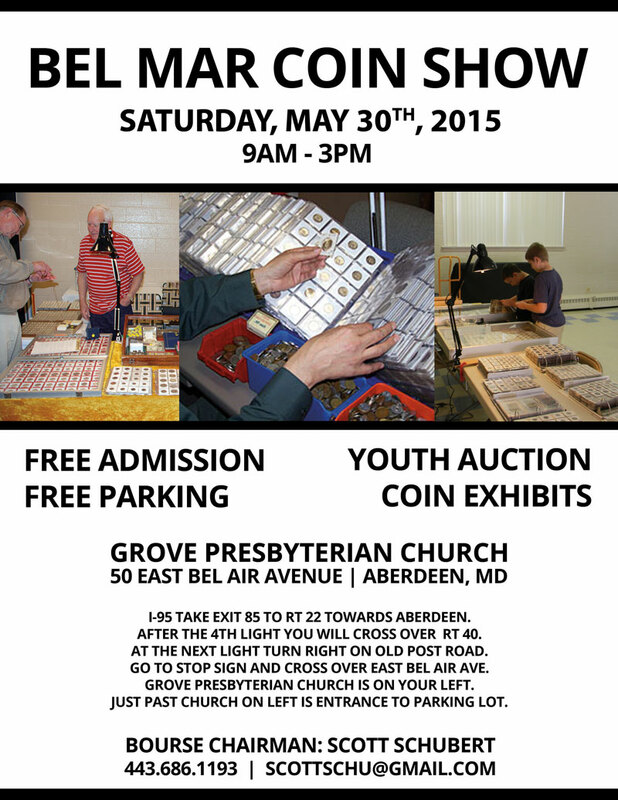 We have set the date for our 2015 Coin Show in Aberdeen, Maryland. The Hall is rented, and Bourse Applications are being mailed out to Coin Dealers for this year’s Show which will be on May 30th, 2015 from 9:00 am to 3:00 pm. Click on the Coin Shows Tab for more info, or to see a copy of our Flyer for the Show. Hope to see you at an upcoming Club Meeting or at our next Coin Show! 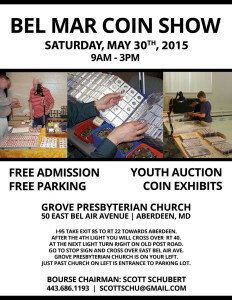 Saturday May 30th, 2015 is the Annual Bel Mar Coin Club Show in Aberdeen, Maryland! Please add us to your Calendar and stop by 9:00 am to 3:00 pm. Future posts and articles will include educational information for new Coin Collectors as well as additional links to some of our favorite resources for the Veteran Numismatist. Please check back and visit our site often. You can also Subscribe to our Website by clicking on the Subscribe Button to the right and selecting your favorite Reader, or entering your email address. This way you can be notified of new listings and upcoming Meetings and Shows. Minting Coins – then and now! Meeting & Auction Monday March 19th!